The first of the meetings for 2016 was held on Wednesday 16th March with 17 attendees. 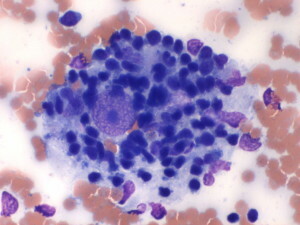 Emma started the evening presenting a case of erythroleukaemia in a cat; an odd splenic reaction in a dog with bizarre histiocytic cells showing lymphocytic phagocytosis or emperipolesis( see image), that has similarities to Rosai-Dorfman syndrome in humans; and ocular encephalitozoonosis in a cat. Mike presented a case of psoriasiform lichenoid dermatosis in a springer spaniel, prostatic squamous metaplasia in a supposedly castrated dog in which a retained testis and Sertoli cell tumour was later identified and a case of haemophagocytic haemangiosarcoma in a dog. Cheryl described epidermolysis bullosa in a group of 1 day old mice. Ross presented a case of bacterial suppurative pneumonia in a cat and discussed differentials including tb for the gross appearance and eugonic fermenter 4 bacteria. Trevor presented cases of hibernoma, lymphocytic myocarditis in a donkey with the differential of lymphoma, granulomatous scleritis in a dog and a JRT with swollen, granular type cells of uncertain origin in the colon. Sean presented an unusual dual positive CD3 CD117 lymphoma, carcinosarcoma in ectopic thryroid tissue in the submandibular region and metastatic osteosarcoma in the larynx of a dog. Clare presented an unusual reaction in the subcutis of a cocker spaniel where the consensus of the group was inflammatory possibly a consequence of trauma or tracking foreign body. Lucy presented a case of ‘erythema multiforme’ type change in the lip of a goat possibly post parapoxvirus infection and discussed morphologic features of anterior small intestine endoscopic biopsies in the horse. Venkataraman G et al. (2010) Development of Disseminated Histiocytic Sarcoma in a patient with Autoimmune Lymphoproliferative Syndrome (ALPS) and associated Rosai-Dorfman Disease. Am. J. Surg. Path. 34(4) 589-594.